Sometimes, Facebook is the best. Like if you are eating cereal, and you suddenly wonder how that one girl from high school is doing, you can easily go look at her pictures and see what she's been up to. The best. And then other times, it's the worst. Like when you have a business or blog page, and you want to post things so that all of your followers see it, but they limit the amount of viewers because they want you to pay for higher viewership. So I did some investigating (about stuff that every single one of you probably already knew), and learned a little about how Facebook pages work, and how to get more readership out of it without paying. The reason I'm typing this is because I want you guys to know how to use Facebook and get higher numbers, in case you didn't already know how. I've never seen a post about this before, so once I figured it out, I wanted to share the knowledge. If you look at the image, you can see that links get way less views than statuses (green box with quotations). And even the statuses are only seen by about 10% of people who liked my page. This is why people have started posting things like pictures, and including the link in the description, or writing a status and saying "link in comments." It is because more people will see the post if you don't put it on Facebook as a link. You're probably all saying, "Duh, Tess. We've known this for months." Well, even if there's only one of you who didn't know, I hope this helps. Post an image to your page's wall, and include the link that way. It's nice because the picture preview size for the link is tiny anyway, and if you post a photo, you'll have a nice large picture to attract your viewers. Write a grabbing status, and say "link in comments". This one is great because posts with comments or likes reach even further! You can also write a post and leave an incomplete link (theframedlady.com) as opposed to a complete link (http://www.theframedlady.com) which will actually turn the post into a link. On that note, I'd like to talk about our network and how we help each other. If you have a couple blogging friends who are also trying to "get your name out there," collaborate with them! Tell them, "if you like my blog posts on Facebook, I'll like yours." This will help even more people see the awesome stuff that both of you write. Plus, people are more likely to like or comment on something if there is already some existing likes or comments. And who doesn't like a deal where both parties equally benefit? I wouldn't recommend having more than two or three buddies for this, since keeping track of so many posts that you have to like could get really time consuming for you, and at a certain point, it's not worth your time to spend that much time on Facebook. Hope this helped! Let me know if there's something you do on Facebook to help you get more viewers! I asked a friend to be my Facebook buddy, and I immediately noticed that the amount of people seeing my posts went up and the amount of likes and comments went up. Just one person liking your stuff for you really does make a difference! Awesome! I hope you notice more views! Michelle, I'd love to, but I already grabbed a couple people to team up with! I'm sure if you message just about any blogging friend, they'd be willing to join forces. I hope you notice more views from it! I just opened a Facebook page, but I'm not sure that I love it... It seems a little less blogger-friendly because of all the restrictions. =( Thanks for posting these tips! It's definitely worth it, but it's not without work (as anything that will bring success). 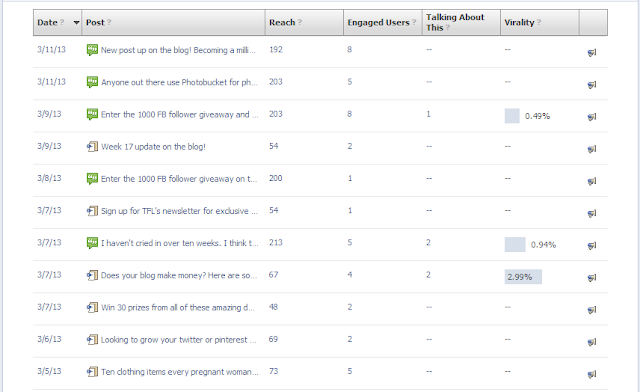 I get a very large percentage of blog pageviews (like 20%) from my facebook page, and that makes it worth it to me. If I stopped using facebook to bring people over to read the blog, my pageviews (and hence, my ad revenue and other income from the blog) would go down. I'd say try for a little bit, but if you aren't getting good traffic, then don't spend too much time focusing on facebook. I only found out about the (link in comments) around a month or two ago. Everyone was doing it and I was like what's going on! ?, Facebook is going down hill for pages, they want you to pay for everything. we should all get together and start a petition! Agreed! I was reading someone's blog who said she actually did try the payment option, and it barely made a difference. Not worth it to me to pay money if I'm not going to get big results. I'd rather just sponsor a blog. We SHOULD all write to facebook and tell them it's sucky that they limit our views. Thanks for all the info! I knew something was up, but I didn't know how to figure it out. Since my facebook page is photography, I tag my clients in their pictures that I post and my posts seem to get more views that way.Or sometimes I'll share my post of my personal fb page and I get a few more views than usual. I think it's a little silly to have to pay to have people looking at my pictures. I honestly didnt know any of this! So you helped me out if it counts for anything! Great information!